In Oracle we now see 11g extended optimizer statistics, an alternative to dynamic_sampling for estimating result set sizes. The default "For all columns size auto"
It is wasteful to create a histogram on a column that is never referenced by a SQL statement. The default value of "for all columns size auto" is the Oracle default and this option will analyze histograms on what the optimizer considers to be "important columns". If your database uses all bind variables, it is best to remove and then disable all histograms. The optimizer does this by examining your current workload when you run the dbms_stats command, interrogating all current SQL in the library cache to see which columns might benefit from a histogram. Oracle also wants you to generate system statistics and statistics on fixed tables. In this section we will look at how you do this. First we will look at gathering system statistics, and then we will look at how you gather statistics on fixed tables. -- Run the next statement to stop gathering statistics. You should only need to run this when things change on your system, such as when you add new disks, adds CPU's or if the system load changes. 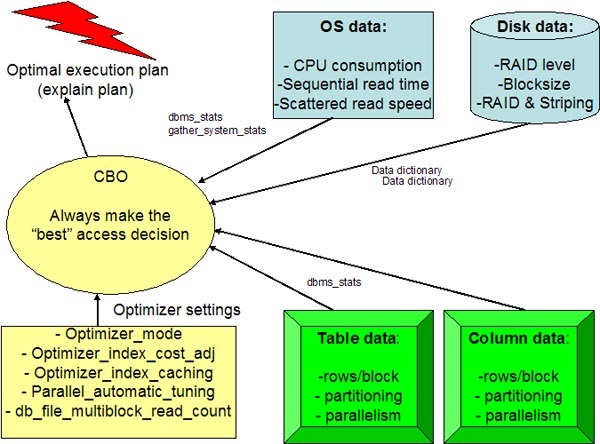 To fully appreciate dbms_stats, you need to examine each of the major directives. Let's take a close look at each directive and see how it is used to gather top-quality statistics for the cost-based SQL optimizer. * gather stale—Only reanalyzes tables with more than 10% modifications (inserts, updates, deletes). Important! In 11g and beyond you should not use estimate percent" and let Oracle default to the automatic sample size. This ensures the "best" sample size with a minimum amount of time spent analyzing tables and indexes. See these updated notes on Oracle estimate percent. Object statistics - Statistics for all tables, partitions, IOTs, etc should be sampled with a "deep" and statistically valid sample size. Foreign key columns - For n-way table joins, the CBO needs to determine the optimal table join order and knowing the cardinality of the intermediate results sets is critical. External statistics - Oracle will sample the CPU cost and I/O cost during statistics collection and use this information to determine the optimal execution plan, based on your optimizer_mode. External statistics are most useful for SQL running in the all_rows optimizer mode. It astonishes me how many shops prohibit any un-approved production changes and yet re-analyze schema stats weekly. Evidently, they do not understand that the purpose of schema re-analysis is to change their production SQL execution plans, and they act surprised when performance changes! Most Oracle experts only recommend scheduled re-analysis for highly dynamic databases, and most shops save one very-deep sample (with histograms), storing the statistic with the dbms_stats.export_schema_stats procedure. The only exceptions are highly-volatile systems (i.e. lab research systems) where a table is huge one-day and small the next. For periodic re-analysis, many shops us the table "monitoring" option and also method_opt "auto" after they are confident that all histograms are in-place. Bi-Modal shops - Many shops get huge benefits from using two sets of stats, one for OLTP (daytime), and another for batch (evening jobs). Test databases - Many Oracle professionals will export their production statistics into the development instances so that the test execution plans more closely resemble the production database. Find skewed columns that are referenced in SQL - Many shops do not use method_opt=skewonly and suffer from poor execution plans on skewed column access. Find histograms for foreign key columns - Many DBAs forget that the CBO must have foreign-key histograms in order to determine the optimal table join order (i.e. the ORDERED hint). Fix the cause, not the symptom - For example, whenever I see a sub-optimal order for table joins, I resist the temptation to add the ORDERED hint, and instead create histograms on the foreign keys of the join to force the CBO to make the best decision. For new features, explore the Oracle10g automatic histogram collection mechanism that interrogates v$sql_plan to see where the foreign keys are used. It claims to generate histograms when appropriate, all automatically. I think I like the first method better, because the statistics will still exist even if the index is dropped and – unlike the second approach – it doesn't change the logical structure of the table.